Preferring the habitat of warm climates like the Mediterranean, our dignitary that gets illuminated today is noble Bay. When I think of Bay the image that immediately comes to mind is of Greek Poets crowned with this leaf of green. 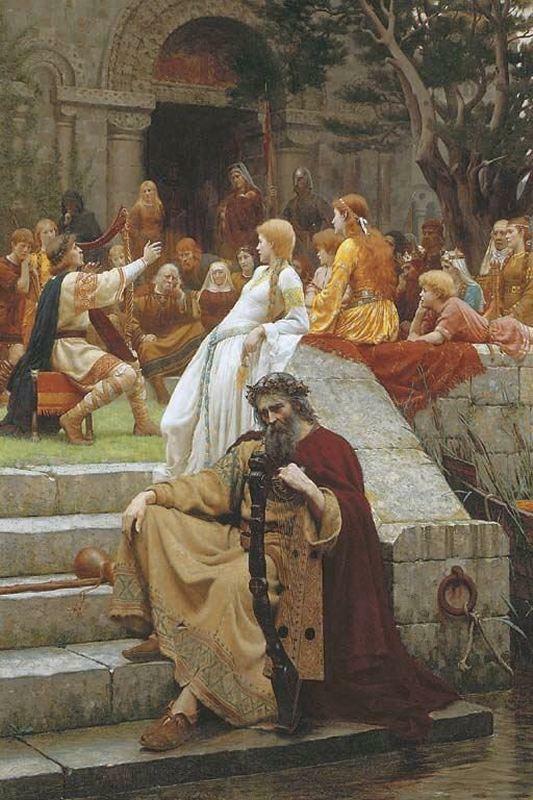 The Greeks and Romans prized this tree and woven into many of their mythologies. One of the most famous is the story of the Greek nymph, Daphne with her lover Apollo, who was transformed into a Laurel tree. Originating in Asia Bay Laurus nobilis has become one of those universal herbs for both flavor and fragrance, particularly in Europe and North America. This particular evergreen goes by many names including Bay Laurel, Grecian Laurel, Roman Bay and Sweet Bay. When seeking out the real thing make sure to go by the Latin binomial Laurus nobilis since there are many other plants with the common name Bay and Laurel. Acclaimed Greek poets were awarded Bay laurel wreaths to wear for academic success which today we call a bachelors degree. The original word was "baccalaurreate" stemming from the words bacca (berry) and lauri (laurel). The cycle of the plant begins with yellow flowers in early Spring followed by dark purple black berries also called fruit. The evergreen leaves are abundant year round. In typical Mediterranean gardens you will find the tree in a pot near the kitchen, pruned to stay small so that the leaves are easily accessible for cooking. Here in California we have a native Bay, Umbellularia californica, which is sometimes confused for true bay. This Bay also has other names which include Pepperwood, Myrtle and Myrtlewood. The California Bay is substantially more aromatic then the true and produces an exquisite essential oil. Be mindful with inhaling the aromatics of the fresh crushed leaves for they may cause a headache. 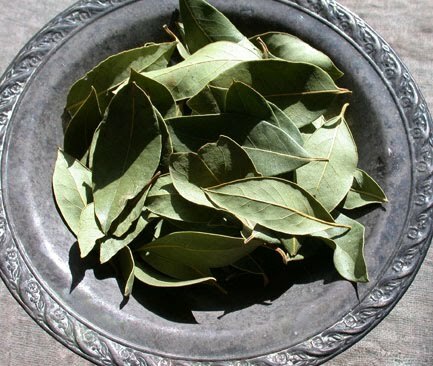 The Chumash tribe of California use the leaves in much the same way that Europeans use their bay leaves, as poultices for headaches and rheumatism as well a decoction for grievances of the stomach. The aroma of the most popular bay laurel has warm notes of spice, herbs and a slightly floral component derived from the chemical eugenol. Eugenol is also located in the essential oils of clove and ylang ylang. In aromatherapy we use Laurus nobilis extracted from the leaves and sometimes the berries. The attribute most often associated with this essence is "stimulation" to many different systems of the body. 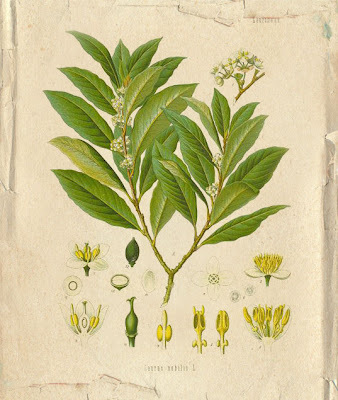 I use bay laurel in my headache and body ache relief preparations. The essential oil of Laurus nobilis is also used in natural botanical perfume. Essences often associated or commonly confused with Bay laurel are Pimenta racemosa (BayRum) and Pimanta dioica (Allspice). Pimenta racemosa from the West Indies is what is used to create a traditional Bay Rum Cologne. Find a formula for creating your own Bay Rum cologne below. Historically the term Bay Rum was derived by the co-distillation of Rum with the Bay leaves of Pimenta racemosa. The Phoenix Myster which has a Bay Rum characteristic, sold out this week, in the meantime while I make a new batch I'll be listing my Bay Rum cologne in the E-shop within the next few days. 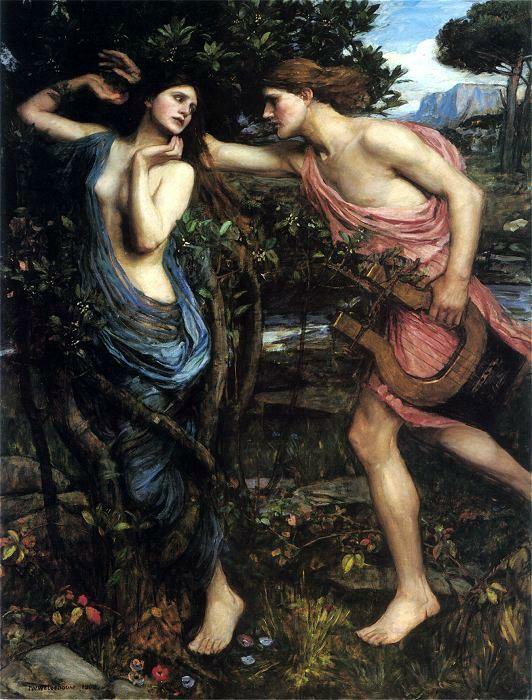 Opening two images: Faded Laurels by Edmund Blair Leighton and Apollo and Daphne by John William Waterhouse. In the 30´s little boy I was. In winter my parents used a kerosene stove to heat our home. When a family member had a cold my mother put on top of the stove a pan with water and laurel leaves. Our noses were very grateful.